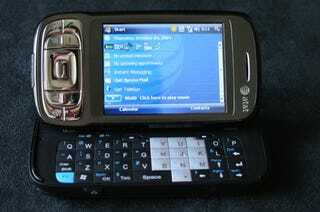 The Gadget: The AT&T Tilt, a Windows Mobile 6 smartphone that has Wi-Fi, Bluetooth, 3G, GPS navigation, a 3-megapixel camera, and Push-to-Talk along with a slide-out/fold-up keyboard and a 2.8-inch touchscreen. It's a Windows Mobile phone, yes, but it's also the Windows Mobile phone with the best GPS package we've seen yet. The Verdict: The 3G, GPS navigation, and Push-to-Talk makes this a much more feature-rich phone than its predecessor, the 8525. However, even though its Qualcomm MSM7200 CPU runs at 400MHz, it's actually noticeably slower than the Sprint Mogul, a similar device that runs a 400MHz MSM7500 CPU. Sliding out the keyboard on the Tilt to switch from portrait to landscape takes about 3.5 seconds, whereas the Mogul only takes a second (the same second as the 8525, running Windows Mobile 5). This same slowness can be seen when comparing the two's browsing speeds when viewing Gizmodo.com. It took the Tilt more than a minute to download the entire page, whereas the Mogul got everything in about 20. After it was done downloading, the page took forever to scroll up/down/left/right, and was on the verge of being unusable. In comparison, the Mogul scrolled pages just fine without much delay. However, we'd be willing to deal with a somewhat sluggish phone thanks to its GPS functionality. The Tilt comes bundled with a copy of TeleNAV, which allows the GPS receiver inside to power an almost standalone-GPS-level of navigation. All the standard vehicle navigation features are there, unlike on the Helio Ocean, and the map is very usable and very responsive when both using directions (it detects when you've veered off course) and just driving around. There's even traffic information that updates in real time as you're redirecting routes. TeleNAV costs $9.99 a month for unlimited trips and $5.99 for ten trips, and requires you to have an active data plan. With the 3G data, it was able to pull down maps and directions at speeds comparable to standalone units. Push-to-Talk is also there via a dedicated button on the side, and when tested, functioned decently for PTT. However, it's essentially a speakerphone call with the other party where you have to push the button to talk. Fairly useless unless you enjoy PTT. The 3.0-megapixel camera isn't great (it's on-par with HTC phones), but it's serviceable if you have nothing else. You can push the camera button down a little to focus, and then all the way to take the picture.